We’ve just rolled out an update to Space Food Truck for all our platforms addressing some of the performance issues we’ve been hearing about. Here’s the list of tweaks for 1.2.285. Fixed memory consumption issue on inventory screen. Should fix the crashes many are reporting on mobile as well as result in notable performance improvement on lower end machines and devices. iOS-only: reduced OS requirement to iOS 8.0. Things have been quiet on the content front while we lay down some foundational work for Space Food Truck. It’s a bit of a slog now, but in the end we’ll be much more efficient at adding things and fixing bugs. We’ve got lots of cool stuff planned for the future of Space Food Truck, so keep an eye on this news feed! That said, the Unity engine update should go live sometime early next week. Anyone wishing to help us put the latest build through its paces can switch over to the ‘thar_be_dragons’ beta branch on Steam this weekend. Be sure to send your feedback and bug reports to bugs@spacefoodtruck.com! You can now zoom in/out on the galaxy map with the mouse scroll wheel. Upgraded SFT project to run on Unity 5 Engine. Optimized rendering performance of galaxy map by ~15-20%. Event Log is more responsive when closed during ship animations. Fixed path highlighting bug in galaxy map where some paths would only partially light up. In addition to some further difficulty tweaks and bug fixes, Space Food Truck Early Access is getting 28 brand new achievements and eight Steam trading cards today! We’re also dropping our price 10% for the Steam Holiday Sale (starting at 10am PST), so for those of you with family gatherings planned this week it’s great time to get on board with our new co-op game. A lot has changed since the original Early Access release, so be sure to leave us some fresh feedback! Test your skills against 28 new achievements. Arrival events are slightly harder, giving less outs for the Engy. Captain’s Overdrive works differently: it now fills your FTL to the max capacity and lets you travel. Fixed bug where ‘connect the dots’ or ‘not enough juice’ errors would spring up when selecting ‘done’ during engage actions. Fixed bug where dock/punch it buttons would disappear during ‘Spacetime Flies’ FTL Arrival events. Fixed hitboxes for selecting crises during diplomabot and in the ship in general. Steam tradings card support has been added. Collect all 8 and craft your badges! Added error message for Captain’s Backtrack, so players can’t add more than the 3 power needed. You can click on flipped/researched nodes in lab to peek at the card in addition to hovering over them for some time. Added more polished animation for trashing cards in resupply phase. 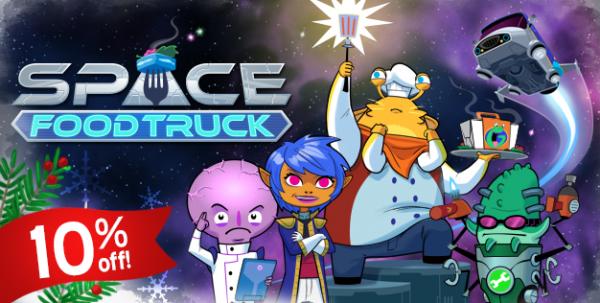 The Indie of the Year competition on indiedb.com is wrapping up, but there’s still time to vote for Space Food Truck. Voters are also entered for a chance to win some Steam games. So maybe Space Food Truck will win something, or maybe you will! Just click the big button below to make somebody possibly a winner. 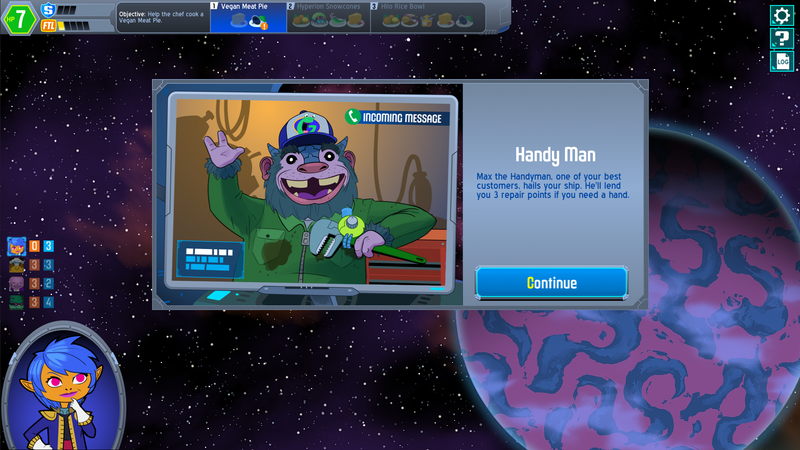 The feedback from Space Food Truck’s Early Access is pouring in, and we’ve already got our sights on some big changes. Rolling out as soon as possible: our least popular cards are being retired to make way for some cooler ones. The Sammich, Footlong Sammich, Echonium, and Enriched Echonium buff your card values if you happened to have sylk or ingredient-type cards in your hand. But that isn’t happening as often as we like. So to improve the usefulness of these cards, their powers are being combined. The new and improved Enriched Echonium will give big bonuses if you have sylk OR ingredients in your hand, making it twice as useful! The Claw of Duty lets you pull job cards from your discard pod, but it doesn’t really feel stronger than the regular Claw. So to make it worth the purchase price, we’re buffing it to pull any card you want from your discard. And if your pod happens to be empty, it’ll now be worth 2 Power to charge your abilities. Lastly, two new items are in works! We hate the Prime Accelerator as much as you guys. So we’re removing it from the game completely, and replacing it with a sweet new card called the Unomas Remote. 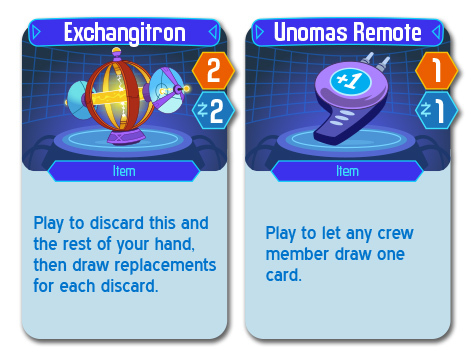 You’ll also soon be able to reach your favorite cards even faster with the powerful and flexible Exchangitron. Another issue that’s been brought to our attention: there are a few boring cards in the Scientist’s lab. We agree, so here’s what’s being changed for each character. The Captain’s Ask Around will no longer have a Power requirement. You’ll get 3 free picks around the galaxy map, so you can save your Power for travel. The Scientist had plenty of Research cards already, so we’re replacing the one in his lab row with a second copy of his powerful Mimicube card. If you’re like us, you avoid unlocking the Engie’s third Upgrade Ship card if you can help it. 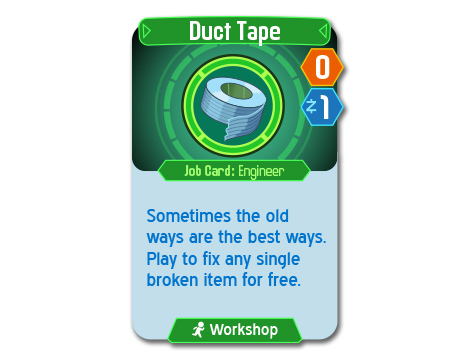 So that’s been replaced with a brand new card called Duct Tape, which can be used to fix any single broken item on the ship for free, no matter how expensive. We’ve got a few more changes in mind that we’ll be ready to post about soon. Huge thanks to everyone who’s supported us and sent in feedback so far. Let us know what you think of these changes, and keep an eye out for new builds on the way to Space Food Truck’s Early Access! Click this to follow your teammate’s point of view. If they go to the map, you’ll follow; if they go to repair something, you’ll see it, and so on. You won’t be able to see their hand at the bottom of the screen, and some screens (like the inventory) don’t show you everything they’re doing yet, but more networked functionality will be added as we move forward. 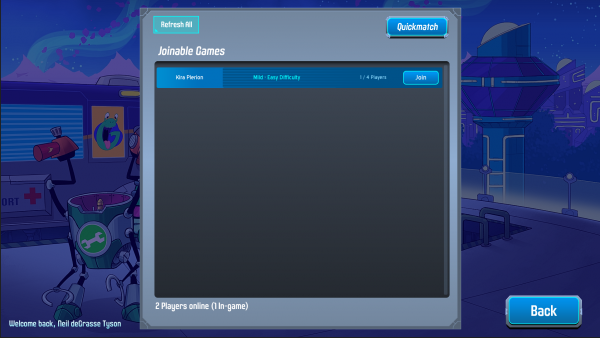 Our goal is to eventually let you watch everything your teammates are up to. And if, at any time, you want to deviate from the current player’s screen and plan ahead for your turn, you can click any nav button or toggle the ‘Watch’ button off to resume control and explore the ship on your own. Added first pass of spectator functionality so online players can get a better sense of what the current player is doing. Fixed bug with galaxy map path rendering that caused visibility issues.